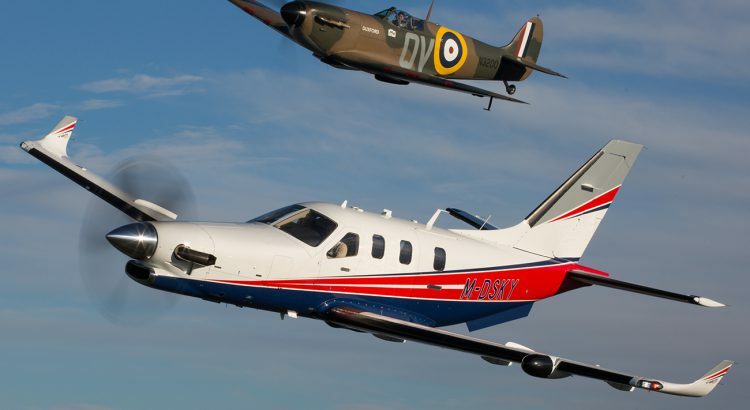 Dr. John C. Taylor, OBE, owner of a Daher TBM 910 very fast turboprop aircraft, received a special present for his birthday last month: a formation flight with one of World War II’s most renowned fighter aircraft: the Spitfire Mark 1a. This unique photo shoot was arranged by David Fabry, the Chief Executive Officer of Flying Smart –Daher’s TBM authorized distributor for U.K. and Ireland, who sold the TBM 910 to Dr. Taylor earlier this year. The legendary Royal Air Force (RAF) warbird belongs to the Imperial War Museum, based at Duxford Airfield in the U.K. The birthday formation flight underscored Dr. Taylor’s family connection with the Spitfire and the RAF. His father, Eric, spent much of his after-work hours during World War II helping young men learn the basics of airmanship by flying gliders – with the most skilled pilots going on to fly Spitfires. Eric Taylor’s daytime job was developing the Taylor electrically-heated flight suit, gloves and boots for crews of bomber aircraft, particularly those aboard long-distance Lancaster bombers on which the gunners had to survive in their turrets for hours at 25,000 ft in very low temperatures. Dr. Taylor maintained the family relationship with aviation by soloing in a glider at the age of 16. Having continued to fly for 65 years, he has logged a total of more than 5,000 flight hours and is an instrument-rated pilot. He is one of the most faithful TBM customers, having owned five different TBMs to date. Dr. Taylor took delivery of his first TBM – a TBM 700A version – in 1991, followed by a TBM 700C2, the TBM 850, a TBM 900, and his current TBM 910.